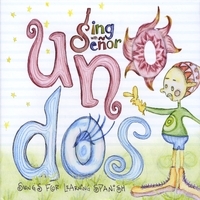 The album Uno, Dos – Songs for Learning Spanish is part of the educational project Sing with Señor. This music is by Felipe Canete, a Chilean native, and the catchy songs teach lots of basic Spanish. You can listen to of all of the Spanish songs online. These are the whole songs, not just clips. The lyrics of the songs and lesson plans are also available on the Sing with Señor website. The Spanish songs on this album teach common vocabulary that coordinates with the curriculum used in many classes. The topics include animals, family, sports and the days of the week. The music is great and accessible to kids. They can easily sing along, and later sing these songs on their own. I really like the level of complexity of these songs. They are not the very simple Spanish that is often used in songs for young children, yet they are not as complex as traditional Spanish language songs. Many are less predictable than other music used for teaching and that makes them more interesting to children. For example, in a counting song, the zero thinks it is an o, but as the song clarifies, the o is a vowel and the zero is a number with no value. The song about fruits is about the many colors and making a rainbow pie. (Just a note, the Spanish word pie, in the song Pie de arco iris, refers to the dessert. The word for this dessert varies from country to country – pay in Mexico, pastel in some countries, pye in Peru.) These songs are perfect for many elementary and middle school programs, as well as for families introducing their children to Spanish at home. Los animales – This is one of the simplest songs on the album. It is has the animal sounds in Spanish and then says Los animales hablan español, Los animales dicen hola en español, Los animales hablan español, Los animales dicen chao en español. The idea of the animals saying hi and bye in Spanish is very sweet! Las vocales – This song introduces the vowels and gives a clear example of one word that begins with each vowel. Al lado de – I like this song because it lends itself so well to a set of actions that can be done in class. Kids need an object of some kind (a small stuffed animal is perfect). They can move the object relative to a chair or desk, or relative to their own bodies. Al lado de – beside – Kids point to the object, indicating that it is beside them. Debajo de – under – Kids hold the object under the chair (or put it under their hands or sit on it). Encima de – on top of – Kids put the object on the desk or chair (or on their heads). Cerca de – Close to – Kids put the object on the floor and stand as close as possible to it. Aquí, allá – Here, there – Kids point at themselves (aquí) and then at the object (allá). ¿Dónde estás?, Estoy Aquí – Where are you? Here I am. – Kids point at themselves again. ¿Dónde está? Está allá. – Where is it? There it is. – Kids point at the object again. You can purchase Uno, Dos – Songs for Learning Spanish from iTunes or cdbaby or Amazon.